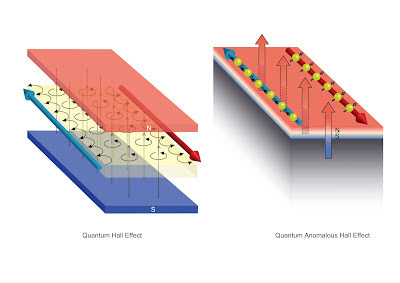 This is a depiction of the quantum Hall effect (left) and the quantum anomalous Hall effect (right). The quantum Hall effect (QHE) describes the quantized transport in two dimensional electron gases placed in a transverse magnetic field: the longitudinal resistance vanishes while the Hall resistance is quantized to a rational multiple of h/e2. The effect was discovered in 1879 by Edwin Hall. But since the electron has not yet been experimentally discovered, application and understanding of the effect had to wait. In 1985, Klaus von Klitzing won the Noble Prize in Physics for discovering that the Hall conductivity was exactly quantized. This phenomenon, referred to as "exact quantization", has allowed for the definition of a new practical standard for electrical resistance. The quantum Hall effect also provides an extremely precise independent determination of the fine structure constant, a quantity of fundamental importance in quantum electrodynamics. A team of researchers at RIKEN and the University of Tokyo has demonstrated a new material that promises to eliminate loss in electrical power transmission. The surprise is that their methodology for solving this classic energy problem is based upon the first realization of a highly exotic type of magnetic semiconductor first theorized less than a decade ago - a magnetic topological insulator. Development of energy saving technologies is one of the central pursuits of modern science. From advancing alternative energy resources like wind and solar power to improving the infrastructure of the electrical power grid, this pursuit by scientists and engineers takes on a variety of forms. One focus in recent years has been eliminating energy loss in the transmission of power itself, which by some estimates consumes more than 10% of all energy being produced. The research team has demonstrated a new material - a magnetic topological insulator - that can eliminate this loss. The work by the RIKEN/UT collaboration is closely related at a landmark discovery from the 1980s, the so-called quantum Hall effect. That effect is known to produce dissipationless electricity channels, but it requires large, cumbersome magnets to produce fields 100,000 larger than the earth's magnetic field for its operation. The RIKEN/UT collaboration circumvented this difficulty by using an exotic type of semiconductor predicted to exhibit a similar effect. In contrast to the quantum Hall effect, this effect, known as the quantum anomalous Hall effect, stems from the semiconductor's own magnetization rather than from an external one. At the heart of this new phenomenon is the interaction between magnetic ions and the topological insulator's current carrying particles (known as Dirac fermions), the latter of which are unique because they behave as if they have zero mass. The devices produced by the RIKEN/UT team are a robust "proof of principle", demonstrating that this new type of dissipationless transport can be harnessed in prototype transistors. While currently requiring cryogenic conditions, improvements in materials design promises to improve the stability of the magnets, making it possible to operate them at higher temperatures. By doing away with external stimuli such as magnetic fields and, in the future, cryogenic cooling, these new magnetic topological insulators may represent the most efficient path to modernizing the power grid by eliminating loss in energy transfer.